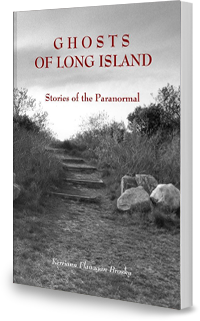 Ghosts of Long Island: Stories of the Paranormal became a huge success for author, photographer and historian Kerriann Flanagan Brosky when it first hit book shelves in 2006. With the assistance of paranormal investigator and medium Joe Giaquinto, Ms. Brosky has uncovered paranormal activities throughout Nassau and Suffolk Counties. Through extensive research and interviews, Ms. Brosky brings you ghost stories, encounters, legends, and never-before-told tales of the inexplicable, in 30 stories with photos. The tales that make up Ghosts of Long Island: Stories of the Paranormal, range from accounts of haunted mansions of the island’s famed Gold Coast to the stories that surround the Fire Island Lighthouse on the South Shore and an abandoned yet mysteriously “occupied” 19th century windmill in the Hamptons. In addition, there are farmhouses, inns, cemeteries, trails and a lake—each with a haunted story to tell. Through historical research, photographs, eyewitness accounts and local lore, Mrs. Brosky Brings these locations and tales to life in vibrant detail.